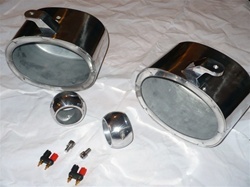 Krypt Towers quality polished aluminum 6 x 9 wakeboard speaker cans. Install the speaker brand you want with this do it yourself package. This product comes with 2 x speaker cans, 2 x tower clamps, and 2 x speaker terminals. All you need to do is supply a little bit of inside wiring, and 2 x 6 x 9 speakers. Top to Bottom Height - 7"
Includes 2 x 6x9 speaker cans, 2 x speaker clamps, and 2 x speaker terminals. Sale Price: $298.97 Lowest Price Guaranteed! Sale Price: $459.97 Lowest Price Guaranteed! Sale Price: $229.97 Lowest Price Guaranteed! Sale Price: $373.97 Lowest Price Guaranteed! I purchased these can’s and a few other items.